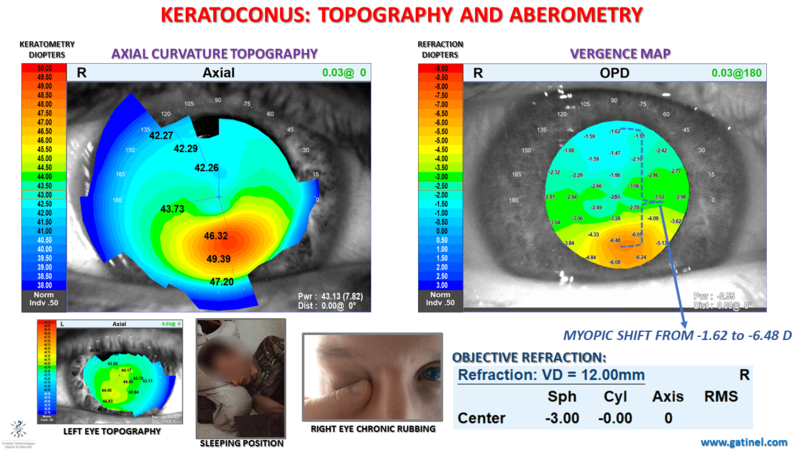 In patients complaining of a reduction in optical quality, aberrometry is a key investigation. It offers the possibility to segregate between low order aberrations, which can be corrected by spectacles, and higher-order aberrations, which explain most of the visual disturbances that persist despite spectacle correction. However, as we will see in this example of a keratoconic eye, the Zernike basis can induce some artifacts in the wavefront interpretation, which can be avoided with the novel LD/HD basis and decomposition method. This keratoconus (KC) was diagnosed using systematic corneal topography, performed in a 24 yo refractive surgery candidate, revealing unilateral keratoconus in the right eye. The left eye topography showed only mild irregularity on the curvature map (Left eye axial topography map: lower inset). 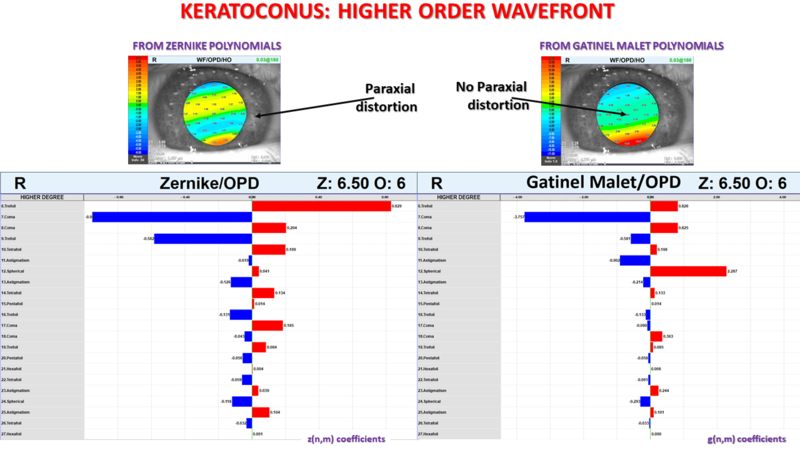 The vergence map shows an asymmetric distribution of the refraction power throughout the pupil area: the marked corneal inferior steepening results in an increase in the vergence inferiorly. The best spectacle correction (objective refraction) predicted by the OPD-scan III is -3 D.
Axial curvature topography and vergence map of the right eye of a patient with unilateral keratoconus (OPD-scan III). The complete description of this case is available here. The unilateral character of the keratoconus was explained by vigorous and excessive ipsilateral right eye rubbing (–>no rub no cone conjecture), the cause of which was attributed to an unhealthy sleeping position (read more about the link between sleeping position and KC). The cessation of eye rubbing has resulted in the absence of progression of the keratoconus since. 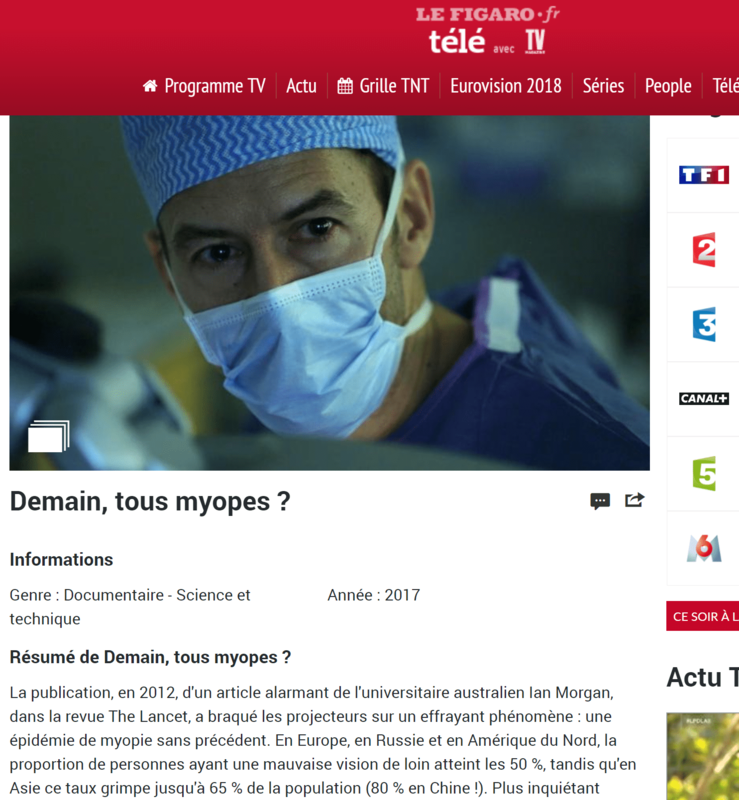 Mild visual disturbances, characterized by vertical monocular diplopia (right eye) have been noticed by the patient, despite the spectacle correction of his myopia. We will focus here on the analysis of the wavefront of this right eye. As we will see, the classic Zernike decomposition fails to provide a relevant estimation of the low order aberration (refraction prediction and astigmatism orientation) and to provide a pertinent prediction of the visual impact of the higher order aberration. Our novel method for wavefront analysis seems to provide a more accurate depiction of the visual status of the analyzed eye. The total ocular wavefront data was acquired with the OPDscan III on a 6.5 mm pupil. Comparison between the Zernike vs LD/HD basis. The low degree modes are identical. The modes of higher degree located in the 3 central columns are different. 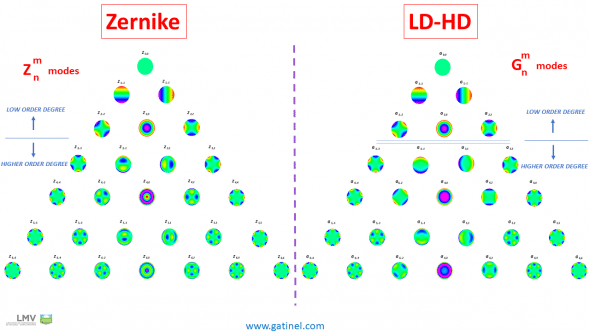 While the Zernike modes exhibit central ripples, the Gatinel Malet modes of the LD / HD classification are « flat » in the paraxial region. Rapid phase shifts at the center of some Zernike modes are caused by the clinically unwanted presence of low-order terms. The first 6 polynomial modes have the exact same mathematical expression in both classifications and belong to the low order aberration component: the shape of these modes incurs rapid phase variation centrally, having a large impact on the sphero-cylindrical refraction. 22 polynomials are used to decompose the higher order wavefront component. Because of their higher radial degree value, the shape of these modes is relatively flat in the center; therefore, their impact on the refractive error of the considered eye is not as pronounced as that of the 2nd order modes: however, some higher order Zernike modes exhibit some rapid phase changes in their central portion. The visual impact of these higher order aberration refers to “optical quality”; reduction of the contrast sensitivity, and perception of visual disturbances such as monocular diplopia, halos, etc. There are differences in the analytical expression of some of these higher order polynomial modes: in the Zernike classification, some aberration modes, such as coma spherical aberration, secondary (or high order) astigmatism contain some low order terms. Hence, the low order and AND the higher order wavefront components of the same ocular wavefront obtained through the Zernike and the LD/HD are different. Representation of the split between the Zernike vs LD/HD decompositions and corresponding wavefront coefficients. As expected, the presence of a corneal deformation causes both an increase in low (myopic astigmatism) and high order modes (coma, trefoil, secondary astigmatism, etc. ). Low order aberrations (tilt and defocus) seem to predominate in the Zernike wavefront decomposition; whereas in the Gatinel Malet decomposition, the total magnitude of the modes belonging to the higher order component exceeds that of the modes present in the low order component, in which tilt has reduced significantly. List of the higher order wavefront coefficients: comparison between the Zernike and LD/HD decompositions. The visual inspection of the Zernike HO wavefront shape shows the presence of a vertical gradient of wavefront error. In the LD/HD decomposition; the HO wavefront error is mostly caused by vertical coma and positive spherical aberration. As expected, LD/HD HO component is paraxially flat. In the Zernike decomposition, trefoil is the most contributory aberration (coefficients line 6 and 9) to the HO wavefront error. The spherical aberration coefficient’s value is negligible. Conversely, coma and spherical aberrations are the most contributory aberrations in the HD component of the LD/HD decomposition. Comparison of the low order wavefront components and coefficients between the Zernike and LD/HD decompositions. In both methods, the presence of a positive coefficient for the defocus suggests that the presence of a myopic refractive error. The vertical/horizontal astigmatism modes’ coefficients have opposite signs! In the Zernike decomposition, the negative sign of the z(2,2) coefficient suggests the presence of with the rule astigmatism. In the LD/HD decomposition, the positive sign of the g(2,2) coefficient suggests the presence of against the rule astigmatism. The refraction predicted from the Gatinel Malet coefficients is closer to the subjective refraction of the analyzed eye. The analysis of astigmatism is particularly difficult in some eyes with elevated higher order aberration such as coma. It is interesting to note that the prediction of the spectacle correctable astigmatism seems more accurate with the LD/HD method. In the Zernike decomposition, the presence of a tilt term in the coma mode results in a central distortion. In the LD/HD decomposition, the coma is flat paraxially. The Zernike coma mode, on the left, has a peculiar tilted shape paraxially. This reflects the consequence of the analytical expression of Zernike coma mode which contains a tilt term. This contamination of a higher order mode (coma) by some lower order wavefront error (tilt) is not based on a clinical need. Rather, the subtraction of a tilt term is necessary to make the coma mode orthogonal to the tilt mode. Consequently, the shape of the Zernike coma wavefront error is distorted centrally. The presence of tilt in the Zernike coma mode also causes a titration artifact, by reducing the value of the “pure” coma coefficient by a factor of 3. This explains the higher magnitude of the vertical coma coefficient g3,-1 in the LD/HD decomposition. Interestingly, the Zernike trefoil mode is pure and not contaminated by a tilt term, because it is “naturally” orthogonal to the tilt mode! The presence of tilt in the Zernike coma mode is undesirable clinically: when the wavefront propagates outside the eye, it is paraxially flat. 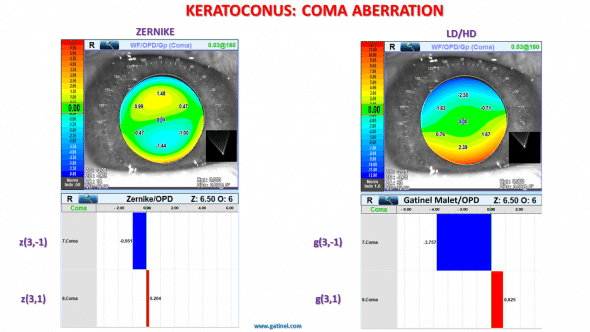 The tilt hidden in the coma mode causes an inadequate orientation of this mode, relative to that of the coma-aberrated wavefront leaving the eye with keratoconus. In the Zernike decomposition, some tilt must be added to the coma to counteract the amount of tilt which it contains. This explains the high value of the tilt coefficient (the amount of compensatory tilt needed is approximately three times the value of the Zernike coma coefficient!). 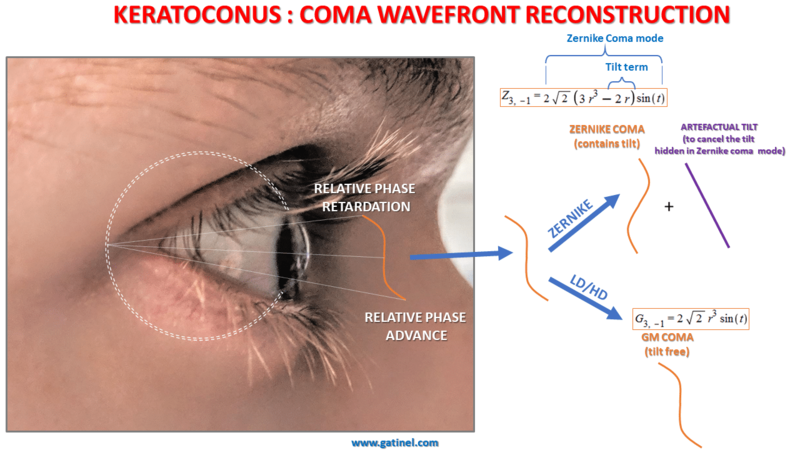 Since it is devoid of tilt, the Gatinel Malet (GM) coma mode is paraxially flat (non tilted), and can confidently model the natural coma wavefront error. As for the tilt, there is also a striking difference between the value of the vertical/horizontal astigmatism coefficients, which predict a “with the rule orientation” in the Zernike decomposition, and an “against the rule orientation” in the LD/HD decomposition. 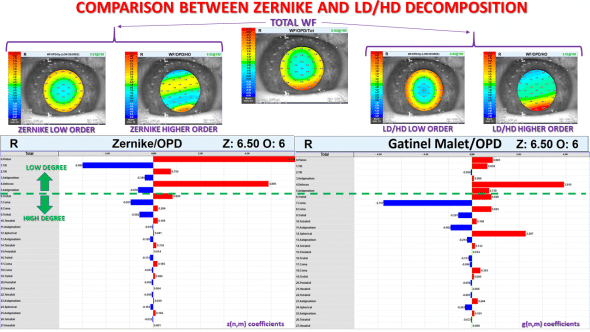 There is a marked discrepancy between the Zernike and LD/HD low order astigmatism orientation. How to can we explain this discrepancy? It involves the (clinically unwanted) presence of a low order astigmatism term within the Zernike higher order (or secondary) astigmatism mode (Z4,2). In the Zernike decomposition, because of a mechanism similar to that involving coma and tilt, the value of the low order astigmatism coefficient is affected by the presence of HO astigmatism. Comparison of the shapes of the 4th order astigmatism modes contribution to the higher order wavefront component in the Zernike vs LD/HD decompositions. The comparison of the shapes of the wavefront error due to the combined higher order astigmatism modes is eloquent. 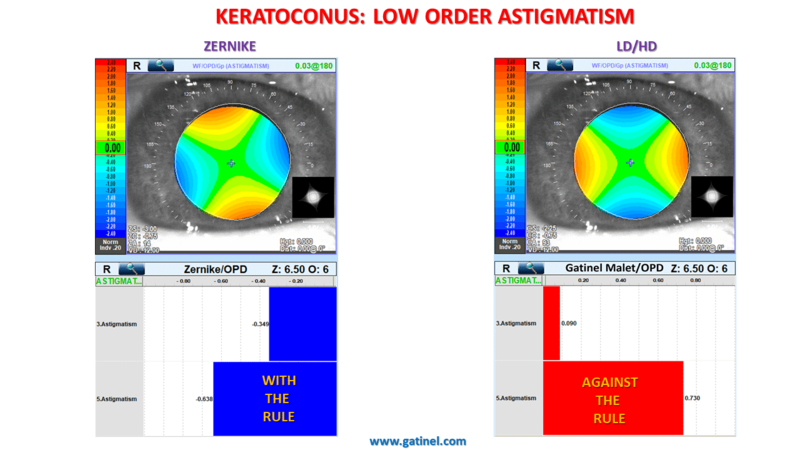 The central portion of the Zernike high order astigmatism is distorted by the presence of the low order astigmatism term. This tormented center zone which suggests that such an error on its own would generate, in itself, large amounts of refractive astigmatism (low order – correctable with spectacle). In this case, this undesirable low order astigmatism term, which has an “against the rule” orientation here, is subtracted from the low order component. 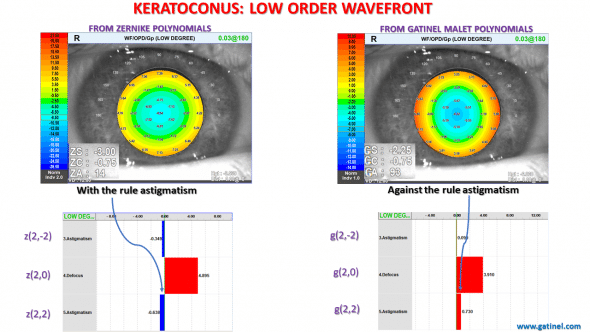 Hence, this clinically relevant wavefront error, which would generate some against the rule low order astigmatism in the ocular refraction, is “hidden” in the secondary astigmatism mode, belonging to the higher order wavefront component. 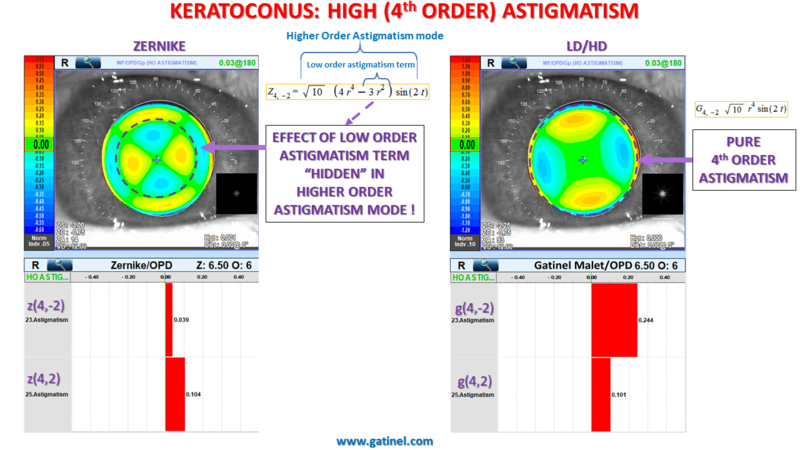 The Gatinel Malet equivalent of the high order astigmatism mode G(4,+/-2) is pure in higher order terms. Therefore, the wavefront shape is flat paracentrally and has a monotonic phase variation in cross section. The PSF computed form the Zernike higher order wavefront component shows subtle differences compared with the PSF computed from the higher order component obtained via the LD/HD method, mostly attributable to the tilt and astigmatism terms embedded in some higher order Zernike modes. 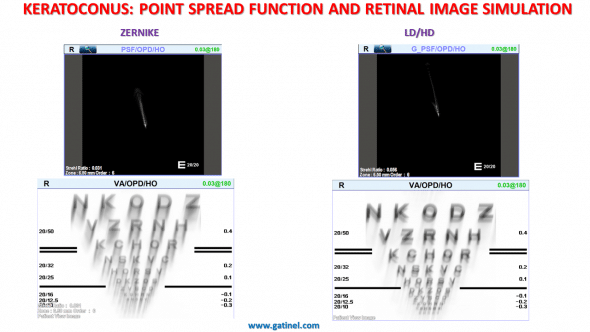 These terms induce an increased PSF degradation, as can be visualized from the retinal image of Snellen chart simulations (which take into account the retinal inversion). Comparison between the Point Spread Function (PSF) and the simulation of the retinal image of an EDTRS chart. The simulation of the retinal image of “E” letters for various resolutions was shown to the patient, along with the corresponding “E” letters. The patient was asked to draw his visual perception of a white E letter on a dark background for various resolutions. 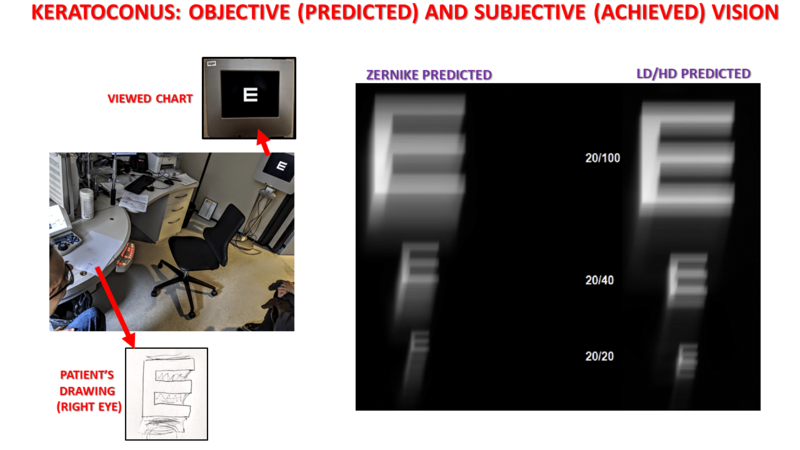 The retinal image of these « E » letters was then predicted using the higher order component of the Zernike vs the LD/HD wavefronts. The drawing of one “E” letter (20/40 visual acuity) as perceived by the patient is shown here. For each resolution, the appropriately refracted patient judged that the LD/HD higher order component predicted resembled his subjective visual perception much more closely. In conclusion, this case highlights the inherent weakness of some aberration modes in the Zernike classification. Just as spherical aberration contains some defocus, coma contains some tilt, and secondary astigmatism contains some lower astigmatism. This can reduce the correspondence between the subjective refraction, visual perception and the equivalent metrics predicted from wavefront analysis. These findings could also have negative consequences on the relevance and effectiveness of custom corrections. In eyes suffering from conditions which compromise their optical quality beyond the presence of a sphero-cylindrical refractive error, such as keratoconic eyes, wavefront analysis remains a precious investigative tool. The LD/HD method shows promising results to better understand the refractive status and visual disturbance experienced by our patients. I express my gratitude to Radhika Rampat, MD, and Adrien Mazharian, MD, who contributed to this page.